Have ready a picture of the gate (no photo, just the black-and-white-sketch as seen in the book, a nice picture can be found here. Stretch the picture in a graphic program (photoshop or other) until it has the same proportions as the door you want to paint and print it out. Then you start working on the door itself. Get the door out of the frame and put it flat on the floor. Then divide it into as many columns and lines as you have on the paper and mark them by pinning the drawing pins into the door (not into the front but into the side parts). Stretch the thread from pin to pin over the door so that you have the raster you drew on the paper on the door now and write the same letters/numbers with pencil on the door you have on the paper. Now you can begin with drawing a sketch with pencil on your door, using the squares you created with the thread as orientation since you know now in which square a line has to start and where to end, when it starts in square C5 on the paper it will start in the same square on the door, that makes drawing much easier. I recommend starting with the two columns and the arch, then drawing the trees and then everything esle. If your squares are too big you can subdivide them on the paper into smaller squares, that makes it easier, especially while drawing the two trees. After you’ve drawn the complete(!) image with pencil on the door, you take off the pins and the thread and start painting the door with the felt pen, following the pencil lines. 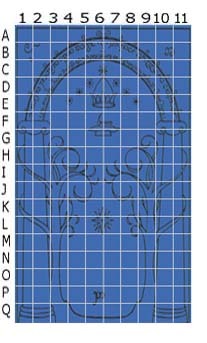 Again I recommend starting with the columns since they are the easiest part and you can get used to drawing. Afterwards I’d work from the top to the bottom so that the pencil lines won’t vanish. Painting the door took me about 2 days, preparing the sketch was not much work, not more than half an hour. All in all it was pretty easy. If you think the gate is too small and you have too much free space above it, you can fill it with some stars or similar symbols. I painted five stars over it, one big one in the middle and two smaller ones on each side.